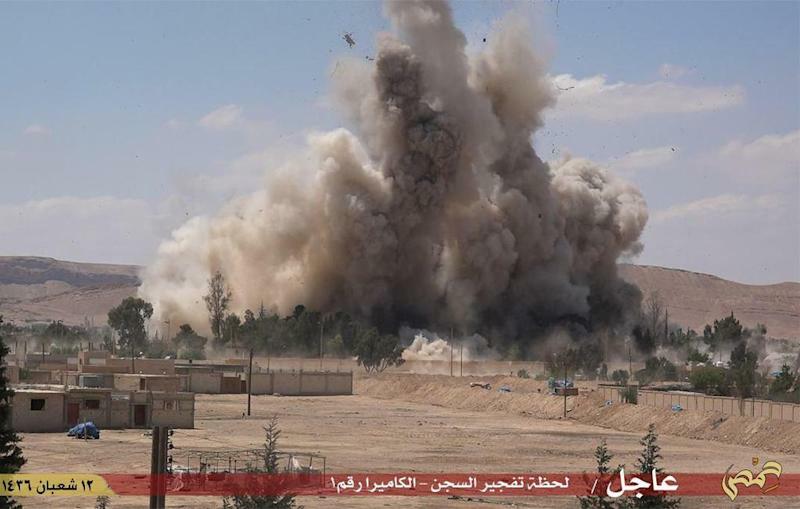 Beirut (AFP) - Islamic State group jihadists demolished a notorious government prison in the historic Syrian city of Palmyra on Saturday, as barrel bombs dropped by regime helicopters killed more than 70 civilians in Aleppo. In neighbouring Iraq, government forces retook an area west of the city of Ramadi, which IS overran earlier in May. The Syrian Observatory for Human Rights said IS planted explosives that "largely destroyed" the Palmyra jail, which was for decades a symbol of abuses meted out on regime opponents. Opponents of President Bashar al-Assad welcomed on social media the destruction of the long-feared prison at Palmyra, which IS seized 10 days ago after government forces pulled out. In rebel-held areas of Aleppo province including the city itself, "at least 71 civilians were killed, and dozens wounded when regime helicopters dropped barrel bombs," the Observatory said. In the worst carnage, 59 civilians, all male, were killed at a market in the jihadist-controlled town of Al-Bab, the Britain-based monitoring group's director Rami Abdel Rahman told AFP. "People often gather on Saturday mornings at the Al-Hail market in Al-Bab, which is why the number of dead was so high," explained Abdel Rahman. He said 12 people were also killed in barrel bomb attacks on Aleppo's rebel-held Al-Shaar neighbourhood, including eight members of a single family. Victims' bodies were laid out on the streets of the neighbourhood, the limp blood-covered hand of one of them protruding from under a blanket, said an AFP correspondent at the scene. Barrel bombs -- crude weapons made of containers packed with explosives -- have often struck schools, hospitals, and markets in Syria. The Observatory said regime forces also dropped barrel bombs Friday in Idlib province, now under the de facto control of rebels after regime forces withdrew, leaving Al-Qaeda and its allies to capture the city of Ariha and surrounding villages. 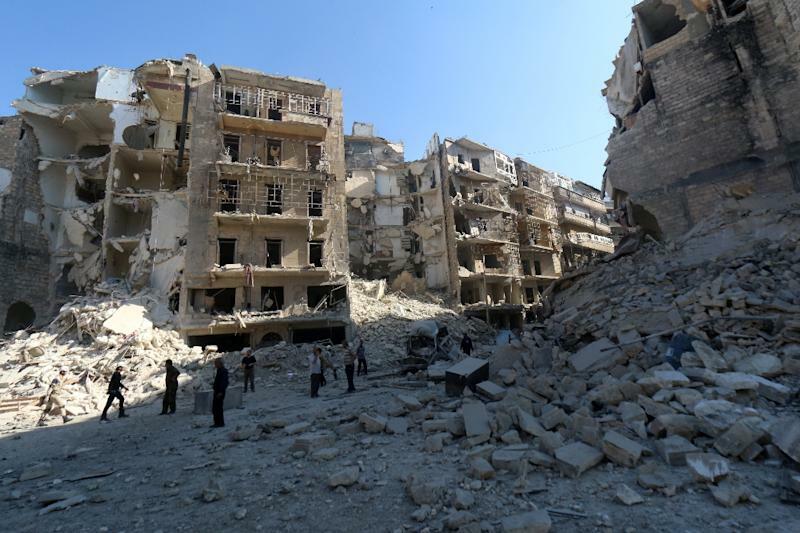 The tactic of carrying out air attacks on built-up areas after battleground losses has become common practise for Syria's regime, which ceded swathes of territory in May. 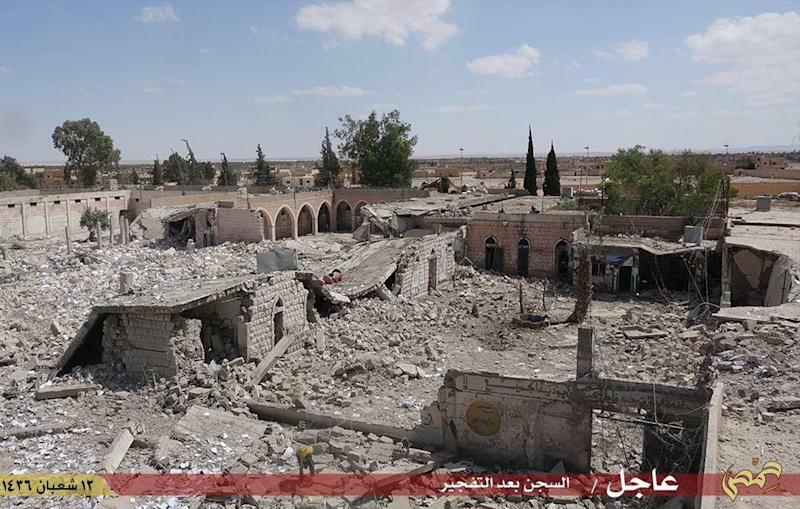 Following defeats in Idlib's provincial capital and at a massive military base nearby, government forces also lost the ancient city of Palmyra to IS jihadists on May 21. In northeast Syria on Saturday, IS launched an assault on Hasakeh city, which has a large Kurdish population. The Observatory said at least 10 pro-government forces and 10 jihadists were killed. In a provincial town to the north, Kurdish militia executed at least 20 civilians Friday, including two children, after accusing them of being IS supporters, the Observatory reported. In Iraq on Saturday, government troops and allied paramilitary forces retook an area west of Ramadi, captured by IS two weeks ago. Hashed al-Shaabi is an umbrella term for mostly Shiite militia and volunteers, and it has played a key role in Iraq's anti-IS fight. But Human Rights Watch accused Iraqi authorities of blocking thousands of families from escaping violence in the mainly Sunni province of Anbar. "Since April 2015, the government has imposed restrictions on entry into Baghdad and Babylon provinces affecting just under 200,000 people fleeing fighting" in Ramadi, the group said. It said the restrictions effectively discriminated against Sunni Arabs. "Prime Minister (Haider al-)Abadi should immediately order these restrictions lifted so that all Iraqis can seek refuge in Baghdad, regardless of origin or religious affiliation," said HRW. And in Turkey, Prime Minister Ahmet Davutoglu described as an election ploy the release of images allegedly showing Turkish intelligence trucks delivering weapons into Syria last year. "The release (of the video footage) right now is an effort aimed at affecting the (June 7) elections," he told AFP. In January 2014, security forces searched trucks near the Turkish-Syrian border on suspicion of smuggling arms into Syria and found Turkish national intelligence personnel on board.